The Triangle Youth Jazz Ensemble during a performance at the Cary Arts Center in 2017. The Triangle Youth Jazz Ensemble may be a group of teenagers but they pack a serious musical punch. 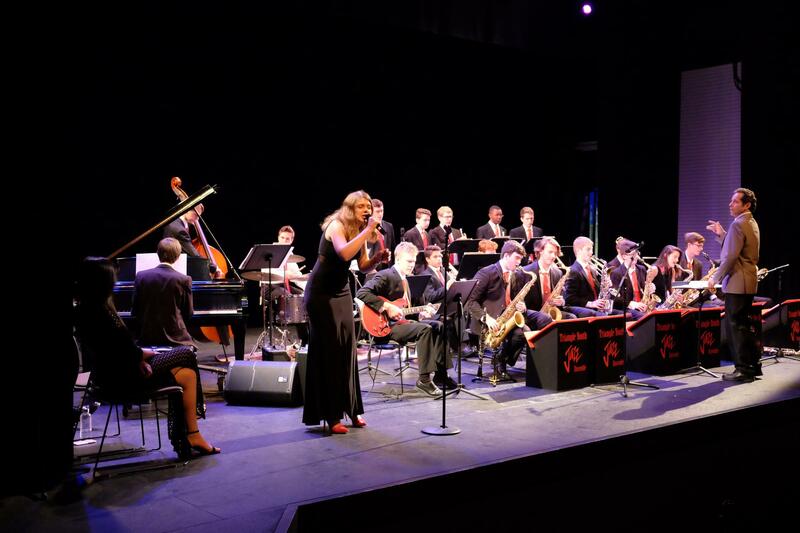 For the fourth year in a row, the ensemble made the cut to compete on stage at New York’s Lincoln Center as part of the Essentially Ellington Competition. More than 100 bands tried out for the competition with only the top 15 earning a spot. Host Frank Stasio talks with The Triangle Youth Jazz Ensemble and they play live in our studio. Host Frank Stasio invites as many ensemble members as can fit into the studio for a live performance and conversation about jazz classics and the tricky art of improvisation. The performers are Jonah Smith on keyboard; Will Hazlehurst on upright bass; Collin Waugh and Toby Falvo on drums; Emma Gonzalez on vocals; Andrew Long on alto sax; Roland Burnot on tenor tax; and Andrew Esch on trumpet. Ensemble director Gregg Gelb also joins the conversation. The Triangle Youth Jazz Ensemble perform their spring concert Sunday, March 31 at the North Carolina Museum of History in Raleigh at 2 p.m.; at Fayetteville State University’s Jazz Day on Saturday, April 6 at 2 p.m.; and a subset of the group will be at Irregardless Cafe in Raleigh at 9 p.m. that evening. The group plays its annual garden party in Raleigh on April 27 at 4 p.m. and heads to New York City for the Essentially Ellington Competition from May 9-11. Ned Ferm was only 4 years old when he decided to pursue a career in music. He grew up on a farm on Mount Desert Island near the coast of Maine and says he is a country boy at heart. But his knack for playing almost any instrument would eventually lead him to perform in New York City alongside renowned jazz icons like Roswell Rudd. Later, Ferm would study jazz at William Paterson University and the Rhythmic Music Conservatory in Denmark, where he earned the equivalent to a doctoral degree in saxophone performance. Greensboro-based Titus Gant is not only a jazz musician, but a music educator who helps bring music to the economically disadvantaged.